Yup, that's right! What you see is what you get! 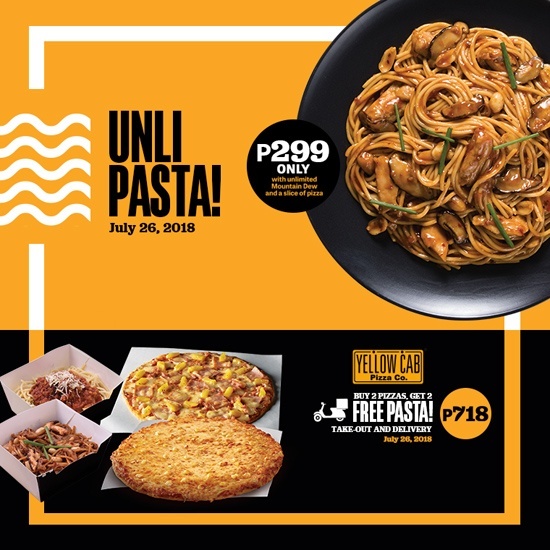 After their slew of unlimited pizza promos, Yellow Cab is now hosting a carb-full event: Unlimited Pasta! You can get all-you-can-eat servings of pasta, a slice of 14" #4 Cheese pizza, and a glass of Mountain Dew for ONLY P299 per person on July 26, 2018. Included in the promo are the Yellow Cab's bestsellers: The classic Spaghetti and Meatballs and the Asian-inspired Charlie Chan that offers a spicy-nutty kick. Diners can only stay a maximum of two hours. See the full list of participating Yellow Cab branches HERE.